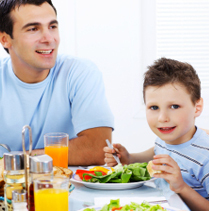 | Healthy Living Articles | Dad’s Health Habits Can Make a Family Difference! It is well established that parental modeling is important in developing good dietary habits in children. Now Dad has more of a reason to maintain a healthy weight and live a healthier lifestyle. Not only will he be a good role model for his children, but he will be helping himself. It is a win-win situation! Obesity is associated with over thirty medical conditions. It has been shown that living a sedentary lifestyle and being overweight or obese puts an individual at a higher risk of diabetes, hypertension, and cardiovascular disease. However, many people do not know that overweight and obese men have been reported to have lower sperm counts and hormonal changes. Weight loss can improve hormonal abnormalities and fertility rates in men. Erectile dysfunction, which is very common in obese males, can also be improved by lifestyle changes favoring weight loss. Turn Off That Television and Eat Dinner as a Family. A number of studies have shown that children who watch more television and eat fewer family meals are more likely to be overweight. Take advantage of the time you have with your family at dinnertime. Make that time a special event. Turn off the TV, get the family together, and catch up and relax. Use family meals as a time to unwind. Trade In Prime-Time TV for a Breath of Fresh Air. Most people are indoors all day, whether it be in an office, a school room, or a car. Instead of sitting on the couch as a family and watching TV after dinner, why not go for a walk outside? You will be burning more calories, helping with digestion of your meal, spending more quality time with the family, and breathing in some fresh air. Stop Watching From The Sidelines. If your kids have a favorite sport, don’t just be their best cheerleader and biggest fan. Make it a habit to practice with them, or set up a father-child game. That way, all of you are sure to get in some good, fun exercise. Watch That Sugar Intake. Studies have shown that a parent’s intake of sugary drinks such as soda, non-nutrient-dense snacks, and take-out food strongly relates to his or her children’s intake of all these foods. Availability of unhealthy foods at home is positively associated with non-nutritious snacking and high-energy fluid intake (i.e. soda, juices, “energy drinks”, and other sugary beverages). 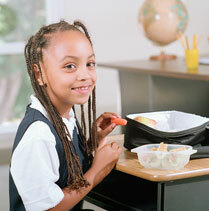 How do you expect your children to eat a balanced diet if they see you surviving off of junk food? Eat Your Veggies. Be a good example, and choose more fruits, vegetables, and whole grains. 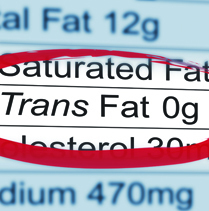 Buy fewer soft drinks and high fat/high caloric snack foods like chips, cookies, and candy. Eat breakfast everyday, and try to eat less fast food. If you practice what you preach, everybody will end up healthier in the end. Do Household Chores Together. You have household jobs that need to be done, right? Why not teach your kids how to do them, and make it family time. You will be getting the job done faster, having fun, and sneaking in some exercise. Who knows, soon you may be looking forward to washing your car on Sundays for those fun water fights. exceeding the calories you truly need. Splitting dishes prevents you and your family from over eating, and emphasizes that you are making positive changes together. Reward successful change. Although being able to loosen a notch in your belt buckle and having more energy may be enough of a reward for you, the rest of your family may need other recognition. Here are simple steps to keep positive change moving forward. Celebrate progress by offering praise and attention. Plan an activity the family likes to do together as a reward. Don’t use food as a reward or punishment. You might unintentionally lay the groundwork for food-related power struggles. Remember, small, gradual changes are easiest to follow, and they can make a big difference over time. Pick a few small changes, and stick to the plan as best you can to evaluate your progress. Sometimes goals need to be adjusted if they don’t work for the family. It’s better to create a new plan than to stick to one that isn’t working! What’s All the Fuss About School Lunch? Lauren is a Clinical Dietitian living in West Palm Beach, Florida, where she works to reduce health disparities among pregnant women and the pediatric population. She earned her undergraduate degree from the University of Florida, and her graduate degree from Rush University in Chicago.